Just when his name had become synonymous with terrible films, Cage stars in the indie drama “Joe” and reminds us that he’s actually an Academy Award winner. As you might suspect, Joe is the name of the title character played by Cage. A washed up ex-con in the middle of nowhere Texas, Joe has a reputation for being tough and a raging alcoholic, but people like him because he takes care of his neighbors and is fair to his employees (a gang of tree poisoners that handle some gray area work for lumber companies). As if the film doesn’t share enough with last year’s “Mud”, Tye Sheridan co-stars as Gary, the boy who is taken in under Joe’s wing after a number of beatings by his loser father. Though Joe himself has a drinking problem, the man is a saint by comparison to Gary’s father. In fact, the actor who plays the father, Gary Poulter, was a homeless man that director David Gordon Green casted. He died in Austin a little after the film was finished. Like many films shot in the South, “Joe” has a perfect sense of atmosphere. The scenery is perfect and the locations, like the local grocery store, give the audience a sense of what kind of world the characters are operating in. Speaking of which, many of the supporting characters, like the grocer who’s obsessed with WWII trinkets and the amateur butcher who runs a local card game, contribute to this atmosphere without letting things slide into a disgusting world of Rob Zombie stereotypes. Though Cage, and the acting overall, is great and the story interesting enough, the film does suffer from unoriginality. Who hasn’t seen a film where a young kid is taken in by a dangerous man and both benefit from their time together? Sounds like everything from “Mud” to “Leon/The Professional”. You might even be able to throw old Westerns like “Shane” into that same category. Of course, there is rarely anything new under the Hollywood sun, but let’s be honest, you could probably map out the majority of the film just based off previous films with similar premises. A bigger problem for the film is its lack of editing. At roughly two hours long, the film barely contains 100 minutes of meaningful scenes. How many times must we watch the same character do the same thing before the director thinks we understand? Roughly the first half of the film follows this timeline: Joe at work, Joe drinking at home, Gary beat by his father, Joe at work, Joe drinks and smokes, Joe visits whorehouse, rinse and repeat. Twenty minutes easily could have been cut from the film and no one would have noticed. 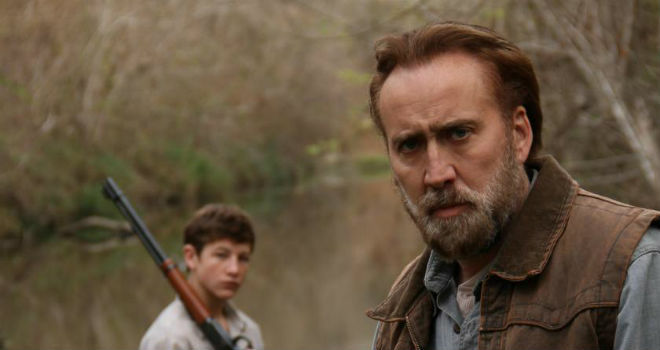 These complaints aside, “Joe” is a good Southern film that gives Nicholas Cage the opportunity to regain some credibility. Even though he’s currently stuck in white trash typecasting, Tye Sheridan proves yet again that he’s going to be an actor to watch. While it may not bring the same kind of good fortune to Cage that “Mud” did for Matthew McConaughey, it’s good to see the actor actually trying again. Three years ago, writer/director Gareth Evans revolutionized the action genre with his simple tale of a SWAT team that gets trapped in an apartment building full of killers in “The Raid: Redemption”. With his second installment of the Indonesian “Raid” series, the tale is not so simple. After the events of the first film, Rama (Iko Uwais) is recruited to go undercover with a ruthless crime syndicate in order to weed out crooked cops hiding within the police force. Similar to films like “The Departed”, the protagonist is forced to give up years of his life in order to get in with the bad guys and build up his street cred. While the story template may sound familiar, the story includes a few twists and turns to separate it from most crime films. The amount of story pumped into this sequel is what sets it apart from its predecessor. Simply looking at the running times, “The Raid 2” is roughly 50 minutes longer than the first go-round. While it’s great to have more plot development, this does affect the pacing of the film. The original’s pacing was perfect, with action sequences being planted so frequently together you could never get bored. Though it would be a stretch to ever call this new film “boring”, I admit to checking my watch more than once. This more developed storyline gives the audience a new collection of villains to enjoy like Julie Estelle’s Hammer Girl and an assassin with an aluminum bat that would give Babe Ruth a lesson in shot-calling. The main baddie is played by Arifin Putra with equal parts smug rich boy and deranged psycho. Sacrificing the claustrophobic feel of “Redemption”, we now get a variety of set pieces for the action including a great nightclub fight with Yayan Ruhian, who stole the show in the first film, and a prison yard fight set in the thickest mud imaginable. Of course the film has a reputation to keep concerning the choreography of its action sequences, and in that regard the film does not disappoint. Although the camera uses a few too many quick cuts and shaky images, the choreography is top notch. The final fight scene between Uwais and Cecep Arif Rahman (pictured above) is worth the price of admission alone. There has been a little noise made over the possibility of an American version of “The Raid” coming soon (because why not?). Hopefully they can hold off until Evans and Co. finish up the trilogy before polluting the water, but on the off chance they actually did it justice, it would be fun to watch American actors putting together similar fight sequences. “The Raid 2” doesn’t run quite as smoothly as its predecessor, but by delivering more story development and continuing the franchise’s high standard for action choreography, the film will still be one of the year’s best action films. Arnold Schwarzenegger sure isn’t getting any younger. At 66 years old, the action star keeps the hits coming with “Sabotage”, another ensemble film like “The Expendables” but with much younger co-stars. “Sabotage” is a crime thriller about a DEA task force that faces unintended consequences after stealing $10 million from a drug cartel. The film features a long list of recognizable faces from Terrence Howard to Josh Holloway and even Sam Worthington, finally returning to an action film set in our universe. John “Breacher” Wharton (Schwarzenegger) is the leader of an elite team of DEA hitters who steal $10 million in drug money after a big bust. As you can imagine, this leads to the team making enemies in the DEA, the cartel and even within their own ranks. In case “Breacher” isn’t a manly enough nickname for you, there’s also “Sugar” (Howard), “Neck” (Holloway), “Monster” (Worthington) and “Grinder” (Joe Manganiello). Feel free to borrow any of those next time you’re at Laser Quest. Sadly missing a cool name is Lizzy (Mireille Enos of AMC’s “The Killing”) who is the lone female on the team and, by far, its craziest member. Though the trailer makes the team across as a family, its really just a roomful of crazy characters who are insanely hard to care about. Hardly five minutes goes by where the majority of them aren’t drunk or high and at each other’s throats. The only members of the team who feel remotely human are Breacher and Monster but even considering them, the only likeable people in the film are the pair of investigators (Olivia Williams and Harold Perrineau) looking into the deaths of these DEA agents. Along with mostly unlikeable characters, the script is a complete mess. Is this a revenge film, a film about corruption in the War on Drugs, both? The themes and character motivations are all over the place and, after watching the finale, you wonder if the filmmakers even knew what kind of film they wanted to make. Since director David Ayer has had a pretty good track record so far (“Training Day”, “End of Watch”, etc. ), it’s probably safe to say that the majority of the film’s problems fall on Skip Woods’ head. Seriously, check out the guy’s IMDB page where you’ll find award-winning screenplays for “Swordfish” and “The A-Team”. To be fair, though, Ayer has had a couple of turkeys as well. For whatever reason, “Sabotage” is a complete mess when it comes to its storyline and, more unforgivably for this kind of film, is utterly boring during the second act. Considering this is where most of the story takes place, that’s not a great thing. 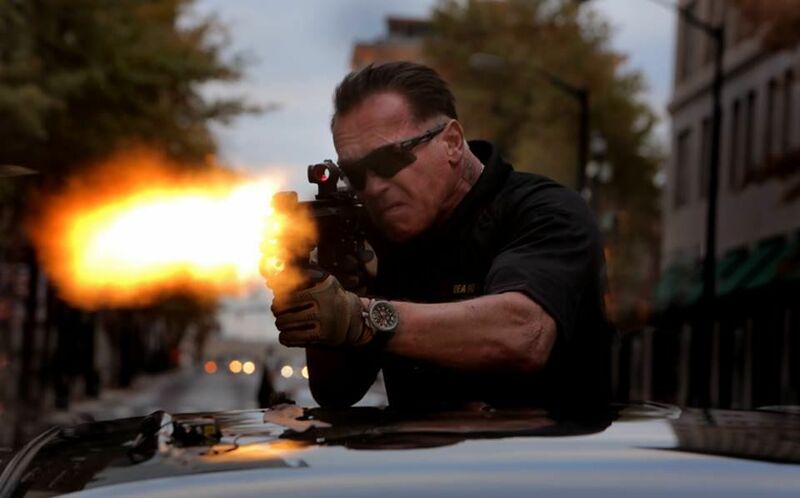 There are two main reasons why one could enjoy “Sabotage”: the action sequences are pretty cool and Arnold Schwarzenegger gives one of his best performances in years. The latter actually makes the film a little worse because you can imagine the potential for the story. “Sabotage” isn’t a horrible film, but the cast deserved a better script and the director is capable of delivering a much better product. All in all, a disappointment.